Saturday was a historic day for North Carolina triple jumpers Christopher Alexander (Rocky River) and Jamar Davis (Orange). The pair brought home All-American finishes with Alexander jumping 50-6.25 inches, good for third place, and Davis for 5th at 50-3.25 inches. 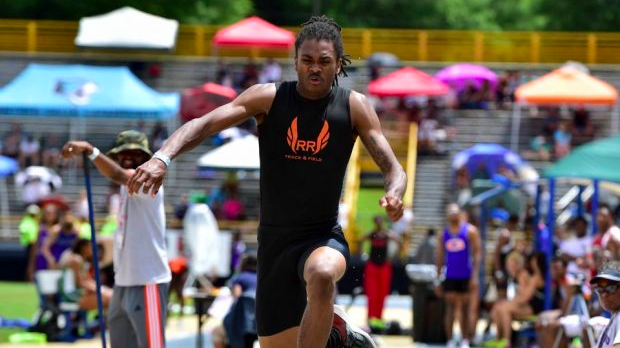 We've had many boys clear 50 feet over the course of North Carolina track, but since 2000 only Andre Tillman (North Rowan, 2004), Brandon Cathcart (Salisbury, 2005) and Terry Wood (North Rowan, 2004) had cleared 50 feet under legal wind outdoors. Lincoln Carr (Pine Forest) jumped 50-7.25 in 2009, but he had a +4.8 wind. Alexander snuck into the finals with a 48-7.5 on his third jump and Davis was just ahead of him with a prelim mark of 48-9. Though they made it to the finals it would definitely take a big jump in the finals to finish as All-Americans in the event. The pair sat in 7th and 6th respectively through the prelims where 8 advanced to the finals. Davis scratched on his 4th attempt, but he bounced back on his fifth jump to clear 50-3.25 (+1.0) inches which moved him into a tie for 2nd place with one jump remaining. Alexander came up short of improving on his best jump narrowly on his next two attempts and sat in 7th overall in the competition. He hadn't cleared 48 feet all day and the junior had just one jump remaining to make it happen. Alexander finally hit the big jump he'd been looking for all competition on his final jump. He measured at 50-6.25 inches to move up into the 2nd spot! Treyvon Ferguson (PA) would clear 50-9.25 shortly after to bump Alexander down to 3rd overall finishing as the second American in the competition as Canadian Frederic Hanna won the competition in 50-11. Davis would fall down to a tie for 4th with Justin Forde (CT), but Forde had a second-best jump ahead of Davis bumping him to 5th. Alexander's performance will fall under the 14th best jump under All-Conditions in North Carolina history. Davis will improve to NC#20 All-Time under All-Conditions. This has been an incredible year for North Carolina horizontal jumps and it's very exciting to see two athletes clear the 50-foot milestone before the year ends. North Carolina ends the year with Kevin Snyder (Christ School) and Jamar Davis finishing as All-Americans in the Indoor Triple Jump and Chris Alexander and Davis as All-Americans outdoors. The tradition of a 50-foot jumper will likely continue next year with both Alexander and Snyder being juniors. Alexander will end the year sitting at NC#1 and US#8 with Davis at NC#2 and US#10. Only 11 athletes in the country cleared the 50-foot mark this year. Alexander will also return as the nations top Triple Jumper heading into the 2019 season. Davis will head to NC State in the fall.